RAPAPORT... Pandora has lowered its revenue expectations for the third time this year following a disappointing quarter, and will implement a new program to cut costs. The Danish retailer had an “unsatisfactory” third quarter, with global sales down 4% year on year to DKK 4.98 billion ($761.5 million). The retailer has therefore reduced its full-year revenue-growth outlook to between 2% and 4%, from the earlier range of 4% to 7% it announced last quarter. At the beginning of the year, it predicted growth of between 7% and 10%. Charms performed relatively weakly, with buyers choosing to place fewer items than in the past on Pandora’s iconic Moments bracelets. Other jewelry categories recorded growth, the company said. Revenue in the US fell 12% in local currency, while sales in the wider Americas region decreased 6%. Profit for the period plunged 30% to DKK 951 million ($145.4 million). 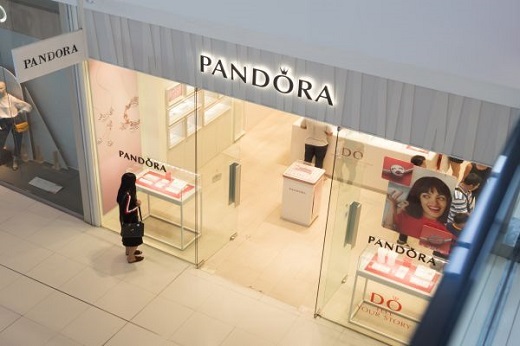 Pandora will implement “Programme Now,” a plan for improving and streamlining its business and reducing costs throughout the organization. The company will significantly reduce its acquisitions of franchisees, and launch fewer new stores than it had originally intended, it said. The jeweler will only open locations in key market areas where it has room to grow, including China, India and Latin America. The company will instead focus on growing its e-commerce presence, it noted. Sales on Pandora’s e-commerce platform increased 52% year on year for the third quarter, comprising 8% of the company’s total revenue, up from 5% a year ago. The current efforts are in addition to the DKK 350 million ($53.5 million) cost reductions the company announced in August, when it also slashed nearly 400 jobs. The retailer is still searching for a replacement for CEO Anders Colding-Friis, who left the company in August following weak second-quarter results. Pandora will use the rest of 2018 and 2019 to “reset the business,” Boyer added.